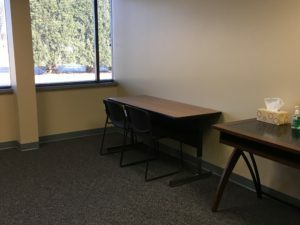 Improvements – Dyslexia Reading Connection, Inc. Since my last blog, we have been busy. I attended two workshops at the Community Foundation, spoke with principals and toured a couple schools in the area, mentored with other executive directors and even attended a local dyslexia presentation. I’m eager to see what is working, what isn’t, and how I can begin to empower change. We have three new tutors in training, including myself. I am in tutor training for the Rock Solid Math program and the Barton Reading & Spelling System so I can begin tutoring soon as well. I am SO excited. We made a few improvements at Dyslexia Reading Connection in the last couple weeks. 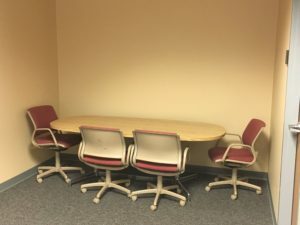 We have new (to us) conference room furniture (Thank you Globe/Broadview University! 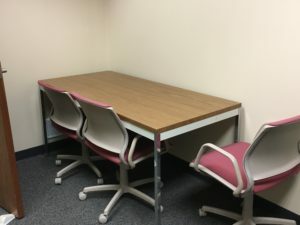 ), we turned an office into a tutor room, and we’ve created quiet zones for two purposes. First, for parents to work, read, or relax. Second, for siblings to complete homework with parental supervision. We are continuing to improve our workspace and your tutoring center. The back hallway has quite a bit of blank wall space and we know that while our students may have dyslexia they have significant talents in other areas. Many are excellent athletes, artists, dancers, musicians, etc. Do you have any pictures or artwork your student created that he/she would like to put on display at Dyslexia Reading Connection? It would help beautify our facility and we can highlight your student and their contribution in a dedicated blog. Please reach out to Kimberly if you have questions or simply bring your items to your next tutoring appointment.